This application visualizes Gcodes and simulates a real 3D print. GCode is a programming language which tells 3D printers (and others) how to make a model. GCode Simulator recognizes the movements and print speeds and can simulate the print in realtime, but you can also speed-up the prints (fast forward). Each layer is painted in a different colour to see how a layer overlaps with the layer below. In addition to the top level view it also renders a front and side view of the object. Now with the new debug mode with step by step execution. In Pause mode it shows the current gcode details and you can step forward/backward with space/backspace. Developed for reprap printers but works with other printers (e.g. Printrbot, Ultimaker,...) as well, tested with Slic3r and skeinforge gcodes. Add GCodeSimulator to the post-processing scripts of your slicer tool (slic3r, Skeinforge) to control the output without manual steps. 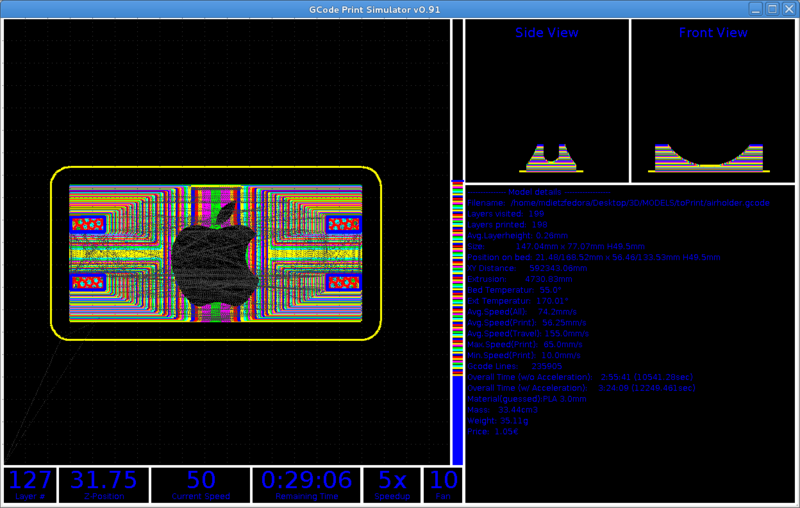 Use GCodeSimulator(PC) to send gcode files to your Android device running GCodePrintr to start a print remotely.